Marta Maria Wiecka was born on 12 January 1874 in Nowy Wieck, Poland, the third of 13 children born to a wealthy Catholic couple. At the age of two Marta fell seriously ill; when the doctors could do no more for her the Wiecka family asked Mary, the Mother of God of Piseczno, to intercede and she recovered. Marta was known as a good-natured, prayerful child who helped her mother with the chores, often taking care of her siblings, and who had a special devotion to St John Nepomucene. On 3 October 1866, Marta made her first Holy Communion. From then on, Jesus became the centre of her life and she never hesitated to walk the 12 kilometres to the parish church in Skarszewy for Mass. When she was 16, Marta applied to the Daughters of Charity of St Vincent de Paul in the neighbouring town of Chelmo, but they told her she was too young to enter. Two years later she tried once again to enter the Congregation. Since the Prussian Government, who dominated that part of Poland, had restricted the number of aspirants in the religious community in Chelmo she approached their convent in Krakow and was accepted. 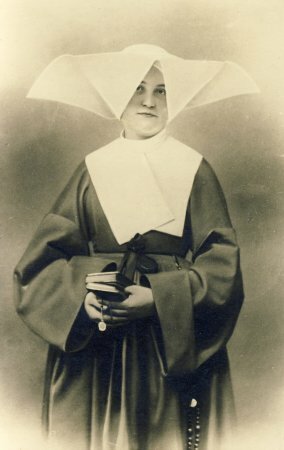 Marta entered the convent on 26 April 1892. On 12 April 1893, she was clothed as a Daughter of Charity and sent on her first mission to a hospital in Lvov. There she quickly acquired the reputation of a Sister who loved her patients and generously served them. In 1894, she was sent to a hospital in Podhajce where she tirelessly served the sick for five years. On 15 August 1897 she made her first vows as a Daughter of Charity, sealing her commitment to serve God in the poor. In 1899 Sr Marta went to the house of her Order in Bochnia. During this period Sr Marta had a vision of Jesus on the Cross; he urged her to endure adversity with patience and promised her that one day she would be with him. This experience strengthened her to endure the adversity which was not long in coming. A mentally ill man, recently released from the hospital where Sr Marta worked, started a rumour that she was pregnant after having an affair with one of her patients - a student who was a nephew of the parish priest. Sr Marta had to live in the midst of the gossip, and remain in Bochnia until time proved her innocence. After the unfounded scandal, Sr Marta was sent to serve at the hospital in Sniatyn. She had a wonderful gift for helping people to be reconciled with God, in fact, she let no one in her care die without receiving the Sacrament of Reconciliation. Both the life and death of Sr Marta demonstrated acts of selfless love. It was in fact this selflessness which cost her her life. A young man, a nurse and father, was assigned to disinfect the room of a typhoid patient. Sr Marta saw his fear and volunteered to perform the task herself. As a result she contracted typhoid. Many prayed for her recovery; even Jews from the local synagogue held a special prayer service for her. Those present at the moment of her death said that she was in ecstasy after receiving her Lord in Holy Communion for the last time. She died on 30 May 1904 in Sniatyn and was buried there. Her grave quickly became the site of prayer and in the years following World War II it became a symbol of unity since various Christian denomination would gather there. She was beatified on Saturday, 24 May 2008 in the Cathedral of Lvov, Ukraine. Cardinal Tarcisio Bertone, S.D.B., Secretary of State presided at the rite of beatification.